Once a year we find lemons, the yellow ones. The rest of the year we buy limes, the green ones. Lime is used almost everyday in the Thai kitchen and to be found at all markets. I use them like I would use lemons, even the peel for zest. The other day I saw these amazingly delicious looking fluffy sticky lemon rolls made by Karen of Bake my Day. Peter is not a fan of lemons, ok he almost hates them. But I love them and the combination of sweet and tart is great. Off course I had to change something. It had nothing to do with the recipe because that’s great. But when I looked for the ingredients for the filling I saw those delicious smelling green cardamom seeds waiting to be used. And cardamom goes nice with cinnamon. I already made the dough with cinnamon and nutmeg. So cardamom in the filling should give it something extra. Some time ago a friend gave us a secondhand blender. I had no idea what a great help it would be. Whenever a recipe called for lemon zest I tried to replace it, not because I don’t like the taste, but because it’s a lot of work to get the zest into itsy bitsy tiny pieces. Now I just put the lemon zest slices in my grinder. Wow, this is just what I needed. That evening we had to try them. These rolls are delicious; soft, juicy, fresh, sweet and tangy. Even though I put lemon glaze on top of the rolls, Peter loved them! For the filling: I mixed all ingredients and added the juice of half a lemon. Set aside until you need it. For the dough: mix all ingredients until you get a rather stiff but supple dough, leave to rise until doubled (approx. 1 hour). Roll out into a rectangle of approx. 25 * 40 cm 10”x15”. Spread the rectangle with the filling. Leave the borders bare. Roll up from the longer side and close the dough. Karen used juice of a whole lemon and her filling oozed out and made a mess. I made approx. 5 cm. 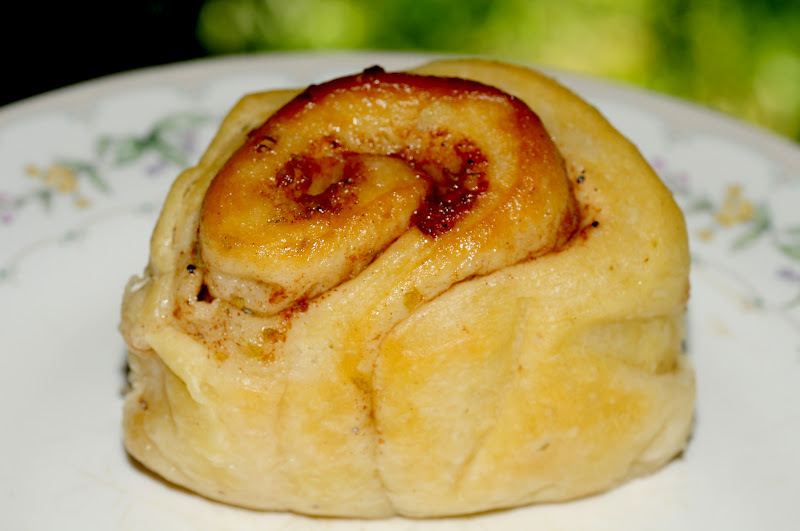 rolls and placed 7 out of 9 in my round cake pan, which I lined with parchment paper. I placed the remaining two rolls on parchment paper. Cover and leave to proof for approx. 45 minutes or until they fill the pan. Preheat oven to 180°C and bake for 30-35 minutes. Don’t over bake them! When cooled I added simple lemon glaze by using the reserved lemon juice and powdered sugar. We ate two and I had to place the others in the freezer before they all disappeared on the same day. Cardamom is one of my absolute favorites. It seems to make everything sweeter and richer without adding anything else. and the smell of fresh ground cardamom is also delicious! Maybe Peter loved these lemon rolls because of the cardamom? Sure looks delicious and fluffy! I think I can imagine what the added cardamom did.... or maybe I should just bake them myself today? Sounds like a plan. Glad the recipe was such a hit! Thanks Karen, they are even more fluffy than the photo shows. I forgot to take a photo and this was already in a plastic bag, ready for the freezer. Maybe next time I only use cardamom. This certainly is a hit! Enjoy baking them again and again. yum!! going to Italy soon and I may bring this recipe with me to try with the fresh lemons from my mom's garden... they look very moist and soft and I totally love lemon in sweets. Hi Barbara, lemons from your mother's garden, that sounds great. Is subscribing to your blog the same a follow a blog? I like to follow your blog and see your lemon rolls. The recipe sounds great! And the pictures are very tempting. I am a huge fan of cinnamon rolls with cardamom already, but the lemon curd variation sounds even better. Hi Stefanie, these rolls are nice and fluffy. I think most fillings will be great with this dough. But, the smell of cardamom is still my favorite. I can't explain how much I would love to wake up to the smell of these beautiful rolls! They sound bright and flavorful and so scrumptious. Thanks Heather, it was nice to wake up and smell these rolls. And with some tea we had a nice breakfast. These will be back! These are amazing and beautiful! I love the combination of lemon and cardamom! How delicious! Thank you Gingered Whisk, we too love the combination of lemon and cardamom. Especially green cardamom,that sent is great.